Papers prepared for circulation to interested people and organisations. Includes two papers on Hawke government's handling of East Timor. 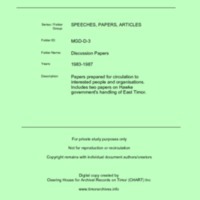 “Discussion Papers [MGD D3],” CHART DIGITAL, accessed April 18, 2019, http://chart-digital.info/items/show/649.